We’re making slow progress on the physical redesign of the restaurant, and one thing we’re excited about is our new open kitchen window. This used to be a wall between the dining room and the kitchen but the construction team got the bones of the window frame in today. Designer Jason Champion and Chef Steve envision lightly tinted glass and a single table underneath it, which will be the new “chef’s table.” Jason is also creating a cool frame for the window using recycled metal that will be uniquely lit. While the restaurant continues its massive physical transformation, Chef Steve is busy hunting down the best sources for sustainable and abundant veggies, seafood and of course, delicious beef. We’re proud to say we will source grass fed beef from Deep Creek Ranch, Inc., a Certified Humane provider out of DeLand, Fla.
Part of the reason Chef chose Deep Creek is for their location here in Florida — it’s not too far away, which saves a lot on transportation costs. While their are lots of great beef options in the midwest, burning gas has many negative impacts, the least of which is the cost. So we’re opting to spend more money on a better quality product and staying true to our commitment to embracing local sources whenever possible. Plus, Deep Creek Ranch is quite an amazing farm. They rear a breed of cattle called “South Poll” (which, an as aside that the music fan in Chef Steve loves, Teddy Gentry from rock band Alabama originated) that is one of the most flavorful as far as both texture and tenderness go. And there are no grains in their diet — many don’t realize that in their natural state, cows do not eat corn — so they are free to roam and consume the grass they like, which is very important to the flavor of the beef. Okay, menu sneak peek for you all! One of the starters Chef Steve has confirmed are his Crispy Parmesan Beignets accompanied by Florida Orange Blossom Honey, Pears and Spice-Glazed Pistachios. The only word is yum. But all that crispy sweetness is sure to make you thirsty, and that’s why we’re also excited to offer a great selection of artisanal beers and wines with a local focus. The variety of beers available in Florida is better than we expected — our friend A.D. Lewis from J.J. Taylor Distributing has helped us to select the Orange Blossom Pilsner from Orlando, for one. The OBP is going to be killer paired with our Crispy Parmesan Beignets, and so is Porter Family Vineyards’ 2009 Chardonnay. The Porters live half of the year in Sarasota and spend the other half of the year tending to their grapes in Napa, so we’re proud to have another local connection on our wine list. It’s been a tough job finding all these tasty beverages to share with you, Sarasota, but we’re going to keep up the hard work until we open this summer! Join us then to try them all yourself. In the first of what will be a series on Chef Steve’s sourcing research for Indigenous, we’re bringing you some information about Babé Farms, one of our produce providers. They remain a family-style farming business and were named Santa Barbara County’s 2010 “Farmer of the Year.” According to their mission, Babé Farms maintains superior quality, innovation and genuine customer relationships, and that’s why we are looking to them during the rough summer season when we have hardly any availability locally. 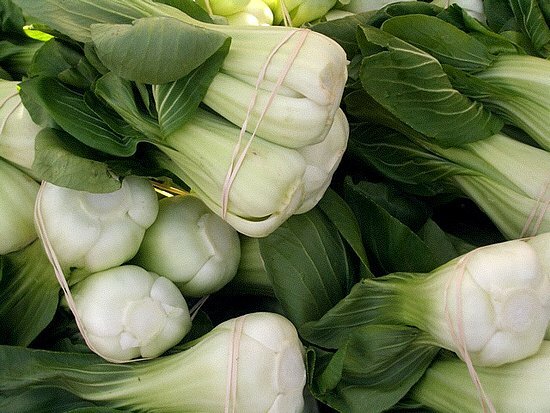 Babé Farms will supply Indigenous with fresh bok choy from which Chef Steve will make kimchi to accompany his famous braised short ribs. He’ll also order parsley root to use as a puree with arctic char and will certainly always have something from their amazing assortment of baby lettuces for salads. Come on in when we open this summer to try all of these dishes and more! Stay tuned to the blog and our Facebook page for as they happen updates. Construction update: no more awning! Lots of excitement and movement here at the restaurant this week! First off, we are really glad to finally remove the old awnings — the place is almost unrecognizable and we haven’t even touched that blue paint! We’ll use this new area to create a space for true al fresco dining, with nothing but umbrella shade between you and the beautiful Sarasota breeze. Designer Jason Champion is also working on a really comfortable and cool seating area for this section of the restaurant. And we relaid the pavers here and moved the large handicap ramp to South Links Avenue, which gives us more outdoor dining space! The transformation of what used to be the dish room is under way — what will be our new “executive” dining room adds 12 more seats inside. Contractor Paul Pierce of Paul Thomas & Associates has also cut into the kitchen wall to create a window so that our diners can not only enjoy the food but watch us prepare it too. Floors will be next to get an overhaul and we’re taking down the old picket fence this week to prepare for the reclaimed cypress we’re going to use to create a much more elegant (and indigenous) enclosure. Stay tuned to the blog and our Facebook page for all the latest updates! Indigenous is getting very close to having the rough draft of the opening menu. This week will be dedicated to meeting farmers, fisherman and other artisans to seal the deal and make sure availability is there for all ingredients. Crafting a menu is never an easy process for any chef — my notebooks look like a mad scientist’s and sometimes I can’t even read my own drawings. But as long as you have passion and direction, you create amazings dishes. I love it. Here’s a quick shot of our new cypress bar top being treated. It is going to be beautiful! The cypress bar is just one of the many indigenous elements the restaurant will feature — in addition to our menu. Keep comin’ back for updates on a progress!